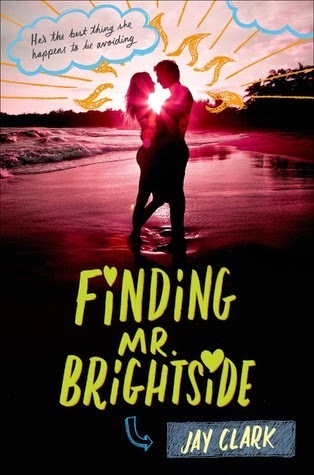 I enjoy quirky romances that happen in unconventional situations and that's what kept me reading Finding Mr. Brightside. It alternates between Abram and Juliette, two teenagers who've lived down the street from each other their entire lives but were never friends. Then their parents (her mom, his dad) begin having an affair that ends in a fatal car crash. Abram and Juliette are grieving and dealing as best they can, with a little help from some antidepressants. Which is how they end up talking for the first time at a pharmacy. The circumstances under which Abram and Juliette come together were pretty strange. I'm sure the last place they expected to find love was with the son/daughter of the person their parent had an affair with. But at the same time, who better to understand what they were going through? I liked the characters a lot and the random way they fit into each other's lives. It was a mix of an understandable curiosity about the other but also a genuine desire to help. Plus some of their conversations were super cute (whales!). Then their parents (the ones who weren't in the affair) are both trying to move on and a big part of the story as well. I especially liked Abram's mom and his relationship with her. Juliette's dad is a little harder to get a read on but I think the point was to show two different adults, reacting in very different ways. There is no right way for any of these characters. They're all doing the best they can. Even though I did like it, there was this big part of me that just wanted more. I don't even know if I can articulate what more I expected exactly. But a lot of things happen throughout the book, particularly with Juliette. She does a lot of things that I didn't really understand and while I loved how patient Abram was even when he couldn't figure her out, the thing is -- I wanted to understand her. And I didn't feel like I did. Although it is clear Abram is good for her and vice-versa. I think because of the circumstances, I just expected the book to be deeper. I mean you find out your parent is having an affair, then that person is gone and you can't ask him/her any questions as to why s/he did it. I think that's huge. Instead the book was pretty light. This isn't bad per se because again, I did like the book but it wasn't enough for me to really like it. I do because I really think it can go either way for the reader depending on your mood and what you're expecting. If you're interested in checking it out, I think you should. But for me, it's more of a borrow from the library kind of book. Ah, Finding Mr. Brightside! It was short, but it was a pretty decent read. I do feel similarly when it comes to wishing for something "more" from this story, since it would have been great to really get to fall in love with both the main characters. I had a lot of issues with Juliette and also definitely wished there was more to this story. Glad to hear I wasn't the only one who didn't get quite what I expected from this story. Ah, it seems I may be on the right track with just borrowing this book than blindly buying it (like I fully intended on doing until reading reviews). That's the problem with this book for me (that I haven't read....), the lack of....I don't know, "emotion" regarding the affair. That is a HUGE thing and the fact that you don't really see too much of it getting deep into it is....unfortunate. Nice review. This sounded like a great book because of the unconventional romance.